Online submission and review of manuscripts is now mandatory for all types of paper. Please prepare your manuscript following the instructions for authors given below “template paper” before submitting it online at http://jmisci.com/about/submissions#onlineSubmissions. If submission is completed successfully, a manuscript ID will appear on screen, and an e-mail acknowledgement will follow. JMISCI do not consider for publication articles that have already been published in substantial part or in full within a scientific journal, book or similar entity. However, posting an article on the author’s personal website or in an institutional repository is not viewed as prior publication and such articles can therefore be submitted. It is the responsibility of authors to inform the journal at the time of submission if and where their article has been previously posted and, if the manuscript is accepted for publication in a journal authors are required to provide a link to the final manuscript alongside the original preprint version. Authors wishing to appeal a decision should outline their reasons for the appeal in an email to the Section Editor. The Section Editor will discuss the case with the Editor and, where necessary, with the responsible Section Editor. The authors will be informed whether the appeal is granted or the original decision is upheld. If you have problem in submission process, please don't hesitate to contact JMISCI editor. 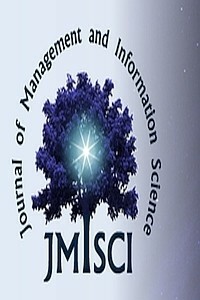 Journal of Management and Information Science uses The Creative Commons copyright licenses and tools. It forms a balance inside the traditional “all rights reserved” setting that copyright law creates. Creative Commons tools give everyone from individual creators to large companies and institutions a simple, standardized way to grant copyright permissions to their creative work. The combination of Creative Commons tools and users is a vast and growing digital commons, a pool of content that can be copied, distributed, edited, remixed, and built upon, all within the boundaries of copyright law.